Sukhmandir Kaur is a Sikh author, educator, and the president of Dharam Khand Sikh Academy. Guru Gobind Singh, the only child of Guru Teg Bahadur and his wife Gujri, was named Gobind Rai at birth. Guru Teg Bahadur settled his family in Patna under the protection of the local Raja while he toured Assam and Bengal, and was not present at the birth. *A Muslim mystic Saiyid Bhikhan Shah journeyed 800 miles and fasted in a prophetic quest to have darshan, and get a glimpse, of the infant prince. The Raja's wife, Maini, had no child of her own and became very fond of Gobind Rai. Every day she prepared chole and poori (spicy chickpea curry and crispy flatbread) for him and his playmates. She later built a gurdwara in her home where she also fed the worshipers chole and poori. This custom still exists today and the gurdwara is now known as Maini Sangat. Leaving his family in the care of Kirpal Chand. Guru Teg Bahadar resumed his duties went to Chak Nanki (Anandpur) ahead of his family. In 1670 The Guru sent word requesting Gobind Rai to be brought to Chak Nanki. Gobind Rai was tutored along the way astounding all who taught him with his brilliance. His early education included martial exercise and training. In 1671, Prince Gobind Rai journeyed with his family through Danapur where the elderly Mai Ji, fed him khichri (khichdi) from her Handiclay kettle. Mai Ji, saved from her own meager stores until she stockpiled enough to feed the guru's entire family, and all of his entourage. When Mai ji, wished for Gobind Rai to remain with her, he advised her to feed the hungry in his name. Gurdwara Handi Sahib, of Danapur, Bihar, has maintained the khichri tradition ever since. Prince Gobind Rai reached Lakhnaur on September 13, 1671, C.E. where his formal education of Gurmukhi and Persian began and the Muslim saint **Arif-ud-Din came to meet him. The Pir proclaimed afterward to his Muhammadan disciples that darshan of the young prince had revealed to him the mysteries of the universe, unveiling the secrets of infinity. When Gobind Rai was about six years old when, at last, he and his mother joined his father in Anandpur where his education continued. When Gobind Rai was about nine years old, a delegation of Hindu Pundits appealed to Guru Teg Badadar for help resisting in forced conversion to Islam. Gobind Rai entered the council and asked what the meeting was about. His father explained, and the boy asked how a solution could be found. His father told him it would require the sacrifice of a great man. Gobind Rai told his father, that as a guru, he was the greatest of men. Guru Teg Bahadur made arrangements to leave Anandpur in order intervene on behalf of Hindus who were being forcibly converted to Islam at sword point. Guru Teg Bahadar appointed his nine-year-old son Gobind Rai to be his successor and tenth guru of the Sikhs. Mughal officers acting under the orders of the Mughal Emperor Aurangzeb arrested and imprisoned the Guru and his companions. The Mughals employed all manner of atrocities and torture in an unsuccessful effort to coerce Guru Teg Bahadar and his companions to convert to Islam. Guru Teg Bahadar and his companions remained true to their faith until their final breath. Other relatives, loyal Sikhs, bards, and minstrels completed his court. After he founded the Khalsa, the parents of *Sahib Devi of Rohtas publicly promised their daughter to Guru Gobind Singh. He accepted the proposal to protect her honor on condition that theirs be a spiritual union. When she requested that he give her a child, the Guru named her Mata Sahib Kaur, mother of the Khalsa. He initiated them as Khalsa giving them Amrit or immortal nectar to drink and then submitted himself for initiation taking the name of Singh. The Khalsa were required to keep five articles of faith and adhere to a strict code of conduct while avoiding four taboos. Gobind Rai engaged in martial training from early childhood. He had a child-sized arsenal of weapons. Games with his playmates took the form of mock battles. After his father's martyrdom, Guru Gobind Rai raised a guard, built a fortress, and practiced military maneuvers. A number of minor conflicts arose with local adversaries over petty jealousies of neighboring kingdoms. 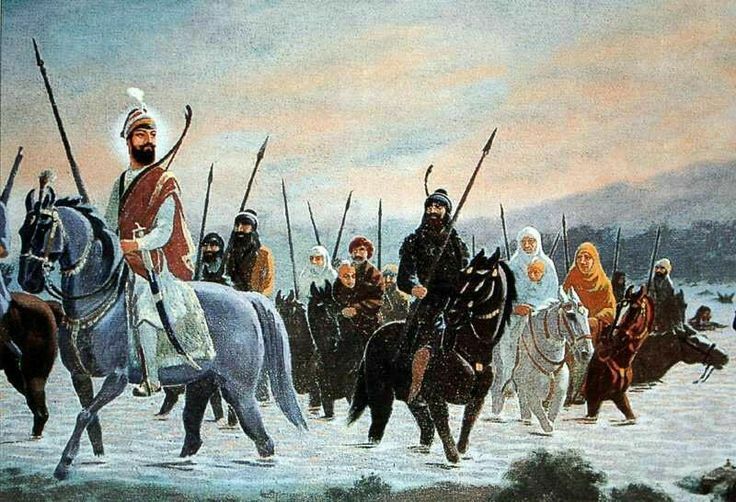 After founding the Khalsa order, Guru Gobind Singh fought a series of major battles attempting to protect his Sikhs and Anandpur from assault by Mughal forces. Vastly outnumbered, courageous Khalsa warriors defended their holdings to the last breath. Shabad Hazaray, which some Sikhs include with their nitnem. Bichitra Natak, considered by many to be his autobiography. Chandi di Var, a rousing description of the battle. Wazir Khan, an official of Sirhind who had ordered the death of Guru Gobind Singh's youngest two sons, later sent assassins to kill the guru. They found the guru in Nanded and attacked him after his evening prayer, stabbing him in his heart. Guru Gobind Singh fought and killed his assailant. Sikhs rushed to his aid and killed the second man. The wound began to heal after but reopened several days later when the guru attempted to use his bow. Realizing his end had come, Guru Gobind Singh assembled his Sikhs and instructed them that the scripture of the Granth should forever be their irreplaceable guru and guide. Dates correspond to the Nanakshahi fixed calendar unless otherwise indicated with A.D. representing the Gregorian calendar or SV the ancient Vikram Samvat calendar. Birth: Patna - January 5, 1667 (December 22, 1966, Julian Calendar). Gujri gives birth to Gobind Rai while his father Guru Teg Bahadar is on tour. Pandits Petition: Anandpur - May 25, 1675, A.D. Gobind Rai remarks that his father Guru Teg Bahadar is worthy to intervene with Moguls on behalf of Kashmiri Brahmans. Inauguration: Anandpur - July 8, 1675, A.D. Guru Teg Bahadar appoints Gobind Rai as 10th guru and takes his leave. Father's Martyrdom: Delhi - November 24, 1675. After being arrested and imprisoned, Guru Gobind Rai's father, Guru Teg Bahadar, is beheaded by order of Mughal Emperor Aurangzeb. ***Jito the daughter of Hari Jas of Lahore. Marriage - Anandpur on 23, Har, SV year 1734, or June 21, 1677, A.D. Participated in first Amrit ceremony Vaisakhi 1699. Death - Anandpur on December 5, 1700, A.D. Cremated nearby Holgarh Fort at Agampura. Memorial at Gurdwara Mata Jito ji, at Garshankar road, Anandpur. Death - Late 1747 A.D. at Delhi. Memorial at Gurdwara Bala Sahib, New Delhi. Birth - Rohtas of Jhelum, Pakistan on 18th of Kattak, SV year 1738, or November 1, 1681, A.D to mother Jasdevi and father Ramoo Busi a Khatri. Marriage 18th of Vaisakh, SV year 1757, or April of 1701 A.D.
Death: SV year 1804, or early 1747 A.D. at Dheli. Memorial at Gurdwara Bala Sahib, New Delhi. Dasam Granth: Paonta - April 1685 A.D. The Guru composes and compiles Dasam Granth while raising an army and training his men at arms near the banks of the River Yamuna. Bhangam - September of 1688 A.D.
Husaini - February 20, 1696, A.D.
Initiation: Anandpur - Vaisakhi, April 14, 1699. Guru Gobind Rai submits himself to the newly created Panj Pyara for initiation into the order of Khalsa, and takes the name of Singh. Siege of Anandpur - May 1705 A.D. Evacuation of Anandpur - December 1705 A.D.
Chamkaur - December 7, 1705, A.D. Ajit Singh and Jujhar Singh (*Zorawar) fall in battle. Guru Gobind Singh is ordered to escape Chamkaur. Sirhind Fatehghar - December 12, 1705, A.D. (13, Poh, 1762 SV) Zarowar Singh (*Jujhar) and Fateh Singh are put to death. Mata Gujri dies in prison. Assassination: Nanded - October 7, 1708. Guru Gobind Singh declares the Guru Granth Sahib as his everlasting successor. What Were the 18th-Century Shaheed Singh Martyrs in Sikh History? Who Was the First Wife of Guru Gobind Singh? What Were the Letters From Guru Gobind Singh to Aurangzeb? Did Guru Gobind Singh Have More Than One Wife?